Friday night we saw a true living legend in concert: Ralph Stanley. If you don’t know him by name or know about the Stanley Brothers, you’d probably recognize his voice as the singer of “O Death” on the O Brother, Where Art Thou? soundtrack. And if you still don’t know what I’m talking about then I can’t help you. The opener was King Wilkie, a fairly new band from Charlottesville, VA that do some nice old-timey music. They put on a great show and didn’t seem too intimidated (although properly awed) to be opening for such a huge act. I bought both of their CDs at intermission, and would definitely see them again when they return to the area. After the intermission, the Clinch Mountain Boys took the stage. The band spans a wide range of ages (the youngest being Nathan Stanley on the mandolin, age 13! ), and every player was a standout. On his own, each of these guys would be a star, but together they are doubly impressive. Once the intros were over and everyone played a little solo, it was time for the man himself to take the stage – Ralph Stanley. Excuse me, Doctor Ralph Stanley (he received an honorary doctorate in music in 1976). He’s 79 years old but his voice still sounds great. His enemy “Arthur Itis” (as he put it) keeps him from playing the banjo too much but he did play a few songs. He sang and functioned as MC, introducing songs, spotlighting the players and keeping everything moving along. There was a sort of dopey vaudeville charm to the whole show. It was a blast, and I’m glad I got to see him while he’s still around to see. 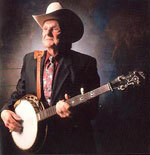 Best line of the night was when Ralph tok the banjo and real quiet-like said, “Boy, I used to tear this thing up”.